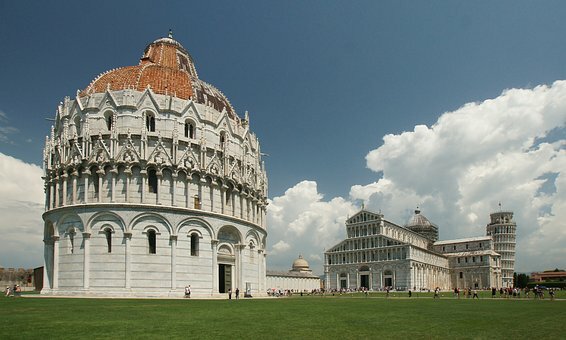 Pisa is world famous for its Leaning Tower, but this makes up just one quarter of the historic buildings within the city's beautiful central Piazza. This 56 metre high tower of beautiful white marble is an iconic attraction that tourists flock to the city to see. 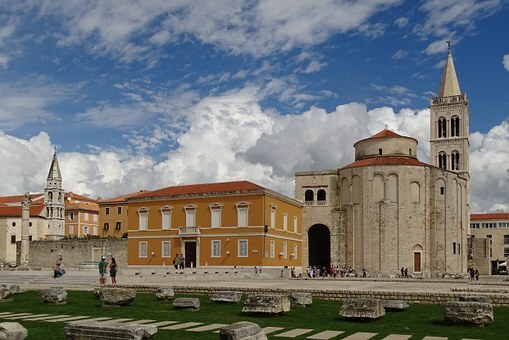 Originally used as a Bell tower or Campanile, it was built to accompany the Cathedral that dominates the Piazza. The tower has never stood upright, and was already leaning by the construction was completed. This was not intentional, but has gained the building far more coverage than it may otherwise have had. The foundations of the Tower have been strengthened over the years, with construction work undertaken to ensure that the soft ground on which the tower was built was shored up to prevent any further tilting. The current tilt is around 4 degrees. This tilt means that here are 296 stairs leading to the south facing viewpoint and only 294 to the north. 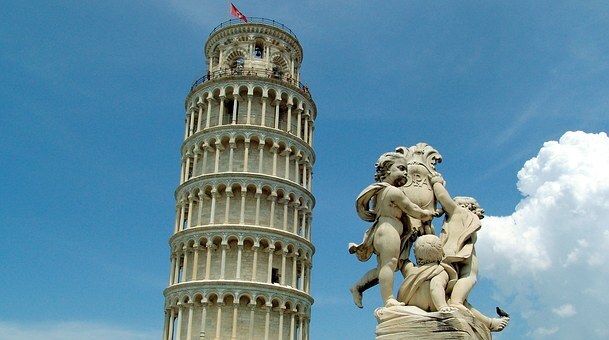 The Tower, as part of the Piazza dei Miracoli, is a UNESCO World Heritage Site. Sitting proudly at the heart of the square, this grey and white mixture of marble and stone more than stands up to its more famous neighbour. The interior of the Cathedral, as you would expect, is no less impressive and contain a number of important historical works, including the Griffin, which, standing at more than 1 metre high, is the largest Islamic sculpture in the world. The pulpit in the building was designed by Italian master, Nicola Pisano. Amongst the other Christian treasure within the walls is one of the Jars of Cana, which was the wedding at which, according to The Bible, saw Jesus perform the miracle of turning water into wine. This Baptistry is the largest in Italy and stands at 55 metres high. As with its neighbours, it is built with Italian marble, but has a touch more colour in its typically Tuscan style terracotta coloured tiled dome which, when coupled with the interior pyramid shaped roof make the chamber of the religious treasure acoustically perfect. The architecture of the Baptistry is a mixture of classic Romanesque at the bottom, with a very Gothic, pointy style towards the upper reaches. This was due to the fact that the structure took quite so long to complete. The interior of the Baptistry, when compared to the Cathedral, is somewhat bereft of embellishment. As with the Duomo, the pulpit here was also designed by #Pisano and dates back to around 1260. Although the inside might lack some of the wow factor seen the Duomo, the exterior is outstanding, so do try to wander around the outside in a daze while you marvel at the gargoyles keeping watch from their perches above. Somewhat unbelievably, the Baptistry is actually taller than the Leaning Tower, although because of its width, it certainly doesn't look it. However, it is only by a very marginal distance and only if you include the height of the statue of St John that tops the dome. This was the final part of the overall complex to be constructed and is a long building, which took just shy of 200 years to build. Campo Santo means Holy Field and, well, what you see is what you get. Heartbreakingly, after a bombing attack towards the end of WW2, the roof of the cemetery building was destroyed by fire and the vast majority of the frescoes, sarcophagi and other artefacts were destroyed. Legend has it that bodies of the dead who were buried within the confines of the Campo Santo would rot within 24 hours, such were the powers of the sacred soil which was shipped over from Jerusalem. 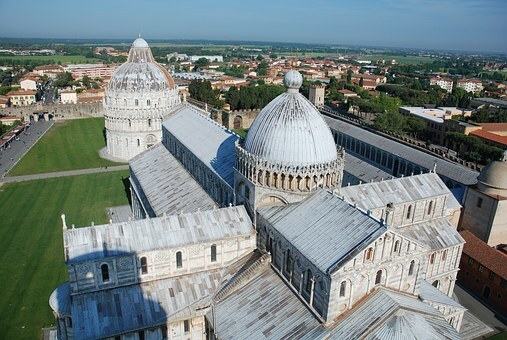 Have you visited Piazza de Miracoli?